Want to save money or see where your money goes? Try a budget tracker! Find ideas for trackers for the month, year, or special event. Using your planner or bullet journal, knowing where money is spent has never been easier (or more fun). 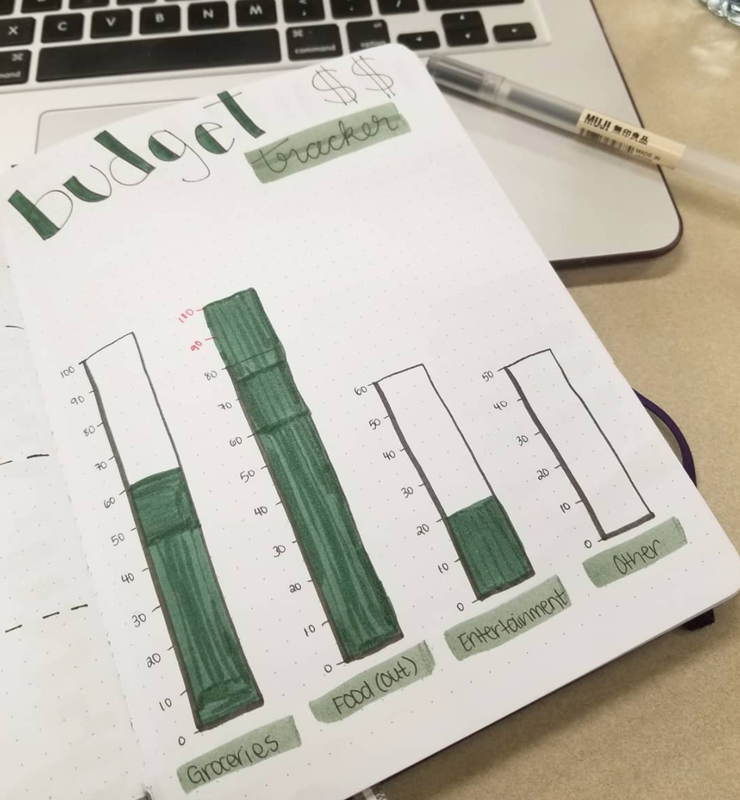 Blank_space_bujo created a minimalist bullet journal budget tracker. This monthly tracker logs income, expenses, and spending for each week. Then everything is totaled at the bottom to see the remaining balance. Createwithanncakes made a pretty in pink budget tracker for the entire year. Using cute icons to mark each expense, she will log her budget, actual spend, and whether it was over or under the budget. There's also space for review and notes. Planningwhimsy monthly budget tracker has sections for fixed and variable expenses. 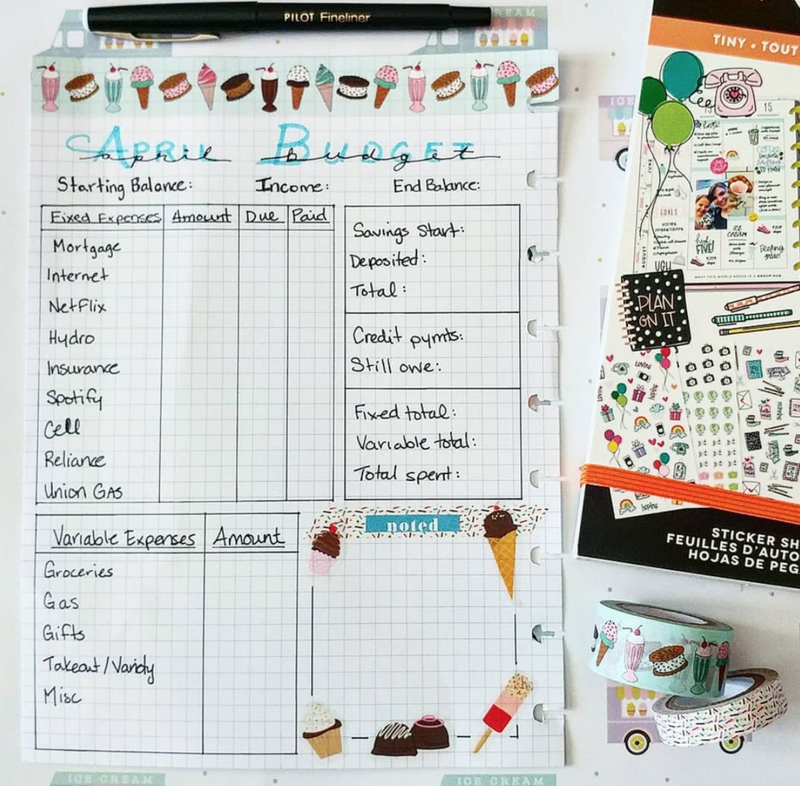 Decorated with stickers and washi tape, this page is a fun way to track bills in your Happy Planner. 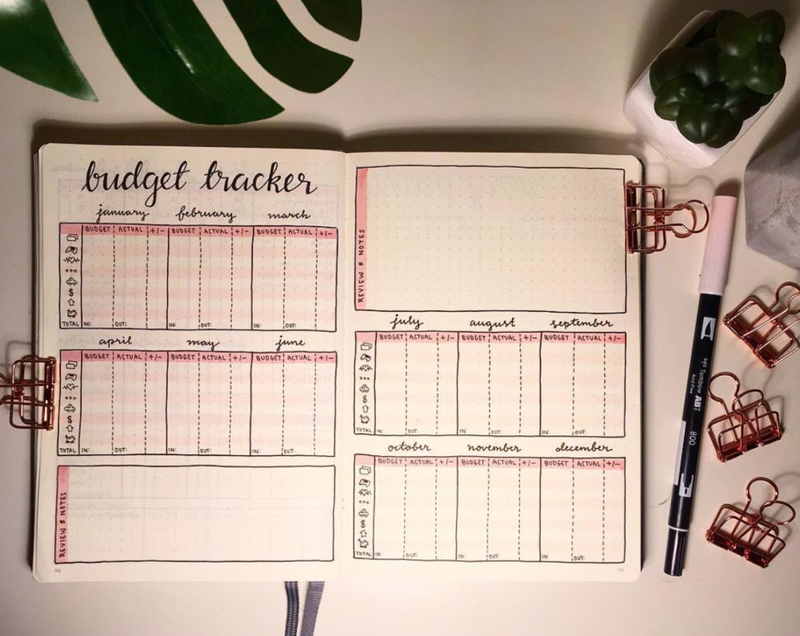 Xxfirefoxxy created a bullet journal budget tracker. This simple layout lists expenses as the occur with columns to note the date, amount paid, and whether it was over or under budget. There's a quote at the bottom that I love, "The are is not in making money, but in keeping it!" Torn_angel has a goal to save money. She's using savings tracker to save $1000. With boxes of achievable $20 increments, it's very satisfying to fill in those boxes often. 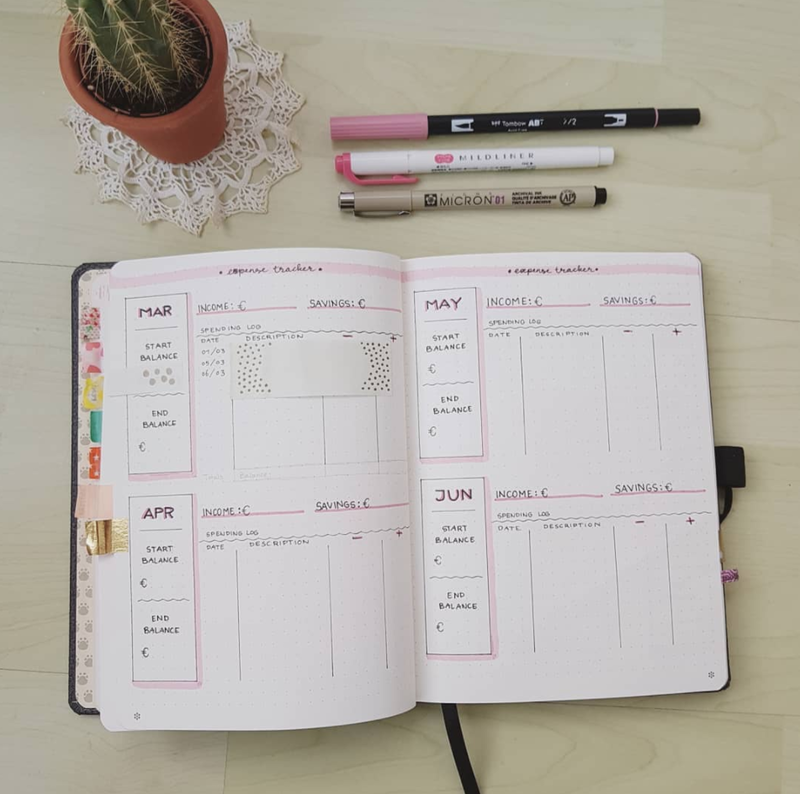 Perpetual_sunflower has an expense tracker in her bullet journal complete with pink Mildliner accents. This spread tracks four months of spending and includes starting and ending balances for each month. A purple feather sets the mood of this month long budget tracker by Bujobylana. Categories such as rent, utilities, groceries, restaurants, and miscellaneous are also tracked weekly. Did you get a tax refund? Keep track of where that money goes! Mickeemariee created tax refund tracker. She's logged the planned expenses. Then left columns for the budget, actual, and date spent. What a great way to track a tax refund or any money you weren't expecting to receive. Tcb_boston created a colorful and cute budget tracker that makes me want to log my expenses! With the title "Treasure Mapping", this monthly spread features sections to track all of the following categories: Income, Tribute, House & Family, Munchies & Social, Shopping, and Miscellaneous. Jenbravehart made a two page budget spread in her bullet journal. The first page uses washi tape and a chevron stripe piece of paper to create a receipts pocket. The second page tracks income, bills, and other monthly expenses. At the bottom there's a section for savings as well as a color code to create a pie chart at the end of the month. It's a good way to track where all the money goes each month. Bujorach made a four category budget tracker using simple columns that get colored in as money is spent. Littlemothermoose budget tracker in Passion Planner is beautifully laid out with washi tape to divide the sections. The main sections include fixed and flexible income with boxes to log spending for every day of the month. 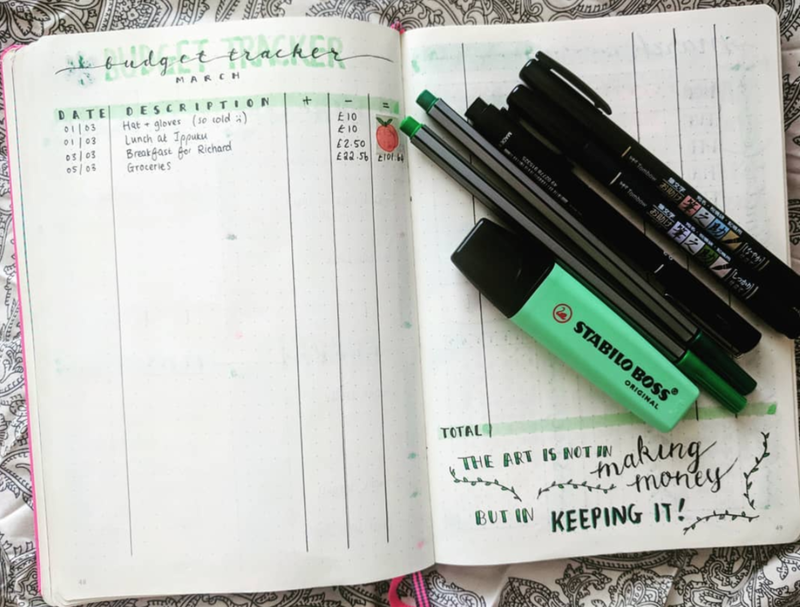 Lustthatbujo is using this planner page to track a wedding budget. The top section is a pie chart showing where money has been allocated for each wedding expense. At the bottom is a tracker that gets colored in when money is spent in each area. Are you tracking your budget for the month or for a special event? What budget trackers have worked best for you? Let me know in the comments below!